Leh: Dec. 8, 2018: To mark the beginning of new year in Ladakh, Losar celebrated today all over Ladakh with great enthusiasm and religious fervor. 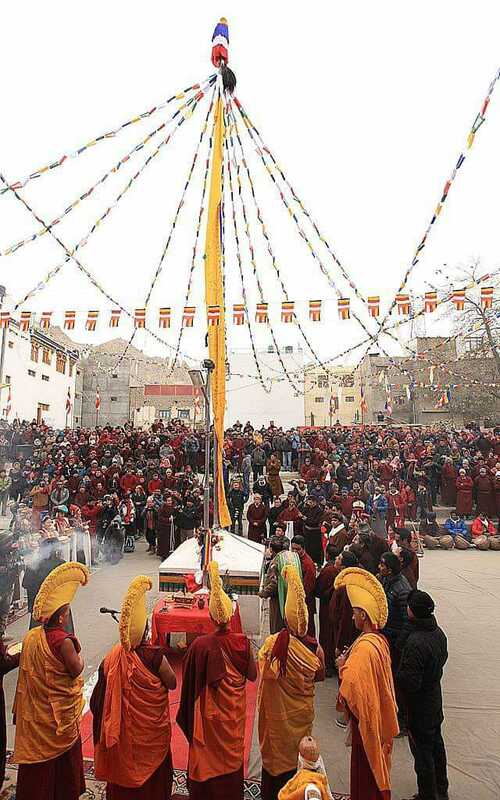 The main celebration was held at Chowkhang vihara under the aegis of Ladakh Buddhist Association where the function was began with unfurling the Tarchen ( Victory Flag) by the LBA chief Tsewang Thinless amid traditional music and victory slogan. The CEC, LAHDC, Leh Jamyang Tsering Namgyal, the Deputy Chairman, LAHDC Gyal P Wangyal, Vice Presidents of LBA, PT Kunzang and Rinchen Namgyal, LBA Women president, Rinchen Angmo, executives of LBA parent, youth and women’s wings, senior political leaders also present besides a huge number of guests and people. Welcoming the guests and audiences, Tsewang Thinless on this occasion greeted the people of Ladakh and conveyed best wishes to all for prosperous new year. He urged upon the Buddhists to take pledge and work together for the betterment of the community. Later speaking to the media persons, the CEC, JTN greeted the people of Ladakh specially the students studying outside Ladakh, Ladakh Scouts Jawans, Police personnel working outside Ladakh, Govt employees and all other Ladakhis on new year and expressed hope that Losar would bring peace, progress and prosperity for all.